MAPS works in the field of informatics applied to process and production control. Projects are carried out in different areas, according to the requirements and specifications of each application. MAPS has the means of design, development, production and adequate infrastructure for the realization of projects. The central facilities are located in Barcelona. They occupy an area of 250m2 and are equipped with the most modern means required to development its activity. The company has an engineering department where the vast majority of its employees are university graduates and have over 20 years experience. MAPS started its activity in 1969 being founded by three engineers, among which Josep Amat i Girbau, renowned professor and researcher at the Polytechnic University of Catalonia. MAPS Early activities were the development and manufacture of equipment for the process control of various systems. A large number of facilities were made in the early years. In the late 70s begins a period of expansion. Growth occurs and start to use more advanced technologies, especially in the area of microcomputers. 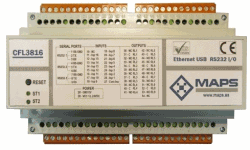 A modular multiprocessor system was designed, based on an 8-bit CPU (S-500 series). This computer is used for both industrial process control, as for the computerized verification of the manufactured equipment, in order to obtain improved quality and reliability. In the 80s, MAPS designs and manufactures a new high performance Industrial computer (S-600 series), based on a 16-bit multiprocessor system. This equipment allows to approach larger production control projects, especially for systems of computer-aided manufacturing (CAD / CAM) and robotic systems. The Industry Department of the Generalitat institution gave MAPS aid for the implementation of new technology products. Specifically, this grant was invested in starting the development of a range of industrial robots and manipulators. MAPS is awarded with the prize for Best Business Initiatives (1984), established by El Periodico de Cataunya journal. MAPS is awarded with the XIII Creativity Award (1995), established by the Official College of Industrial Engineers of Catalonia, on the Computer Vision System, oriented to high-speed inspection. Autonomous guided vehicle for goods transport in CIM manufacturing environments. acquisition and preprocessing card, real-time video signal for standard PC type computers. Design of a complete set of large graphic panels for public information, operated from a central station through the telephone network. The exploitation of this project is done by an advertising company and various municipalities. Manufacture of a panel for real-time monitoring of environmental data in the city of Barcelona. 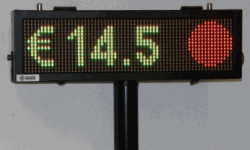 Large alphanumeric displays to show variable information to users on highways, industrial car parks, etc. Different technologies: ferrormagnétic, LEDs, LCDs, etc. 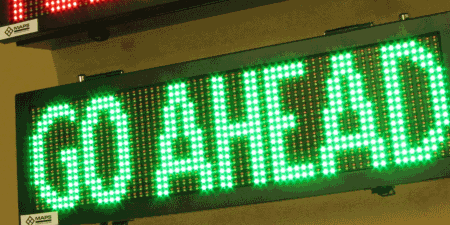 Alphanumeric displays to show variable rates in highway tolls, ferromagnetic, LEDs, LCDs. Design, software and hardware development of a system for production control and real time monitoring of production data from any industry. This system is mainly applied in the plastics industry. Quality control system and verification of electrical parameters in the manufacture of electric motors and the automotive industry. Quality control system of mechanical and electrical functions of car mirrors. Visiomaps: A computer vision system for quality control in industrial production lines: painting control, silkscreen printing control, dimensional control, packaging control of blisters in the food industry, circular shape verification of bulb at high speed, etc. 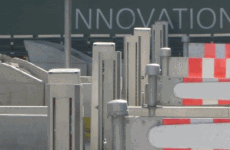 Manual / Automatic barriers to regulate vehicle access. Access Control System for IDIADA in the high-speed track of the Generalitat de Catalunya in Tarragona. For this project a management software is made for the entire system, to control the access to the installations and the interface with the users through large LED displays. The project includes the installation and manufacturing of control barriers over the vehicles to the test tracks, speed control and information panels for drivers. Beacon light system in tunnels. 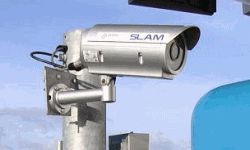 Design and manufacture of optoelectronic equipment to detect and classify vehicles in tolls. Equipped with functions such as flow direction, hesitation, axle counting, height profile, etc and high reliability (error < 1/10000) both at high speed and with stopped traffic. ANPR Automatic Number Plate reader system for vehicles in tolls or at free-flow. Estimation of vehicle queues length at toll. This system facilitates the management and optimization of resources through smart cameras .